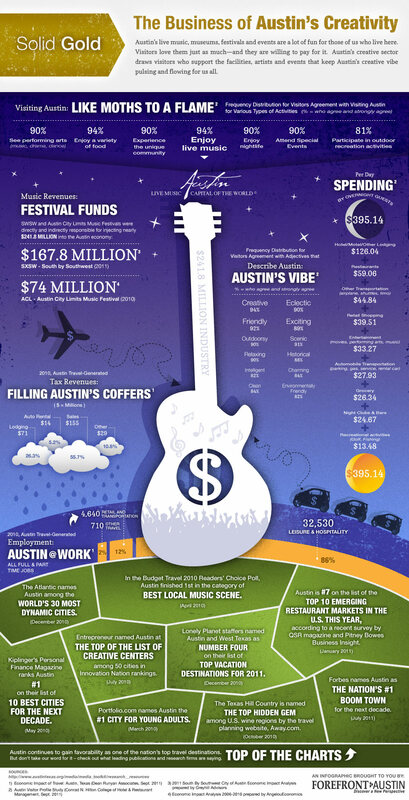 Forefront Austin, a digital media and marketing services company based in Austin, created this neat infographic and we thought we'd share. (Click to view a larger version). Graphic designer Ann Marie Flamenco teamed up with Forefront Austin to create the infographic based off an article and reports from The Austin Convention & Visitors Bureau showing "The Business of Austin's Creativity." Forefront Austin highlights topics that affect the broad community and ask local thought-leaders to share their perspectives, research, successes and challenges.